A meta-analysis was published in JAMA today, the abstract of which can be found here. The paper starts off by noting the inconsistency of the literature both in regards to interventions and systemic reviews conducted, a concern I would like to echo in this blog post. Neither one study nor review should be seen as conclusive. 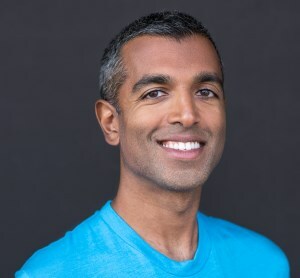 Normally at this point I would mention something about 'not controlling for pre-existing disease states', but since fish oil is touted to help with the heart even in diseased states it may be an irrelevant point to be picky about. Even in the discussion the authors state that they wanted a wide breadth to avoid selective subgroup analysis seen in other meta-analysis. So in a way, the lack of micromanaging the subgroups makes this meta-analysis kind of unique and appreciated. What I truly enjoyed about the methodology was the assessment for publication bias by making a funnel plot and assessing symmetry via a Begg-Mazumbar test. This was to see if industry funding influenced the effects in any way and if there is a likelihood of suppressed results. A collection of large scaled interventions lasting for more than one year were assessed, and the results pitted as a general "what is the risk for mortality or heart disease event in fish oil intervention relative to placebo". Publication bias was also taken into account. As for the results, 3656 citations were found (speaks of the interest in Fish Oil), and 20 fit the criteria mentioned above. Overall, 68,640 persons were studied in these 20 studies and there were 7044 deaths, 3993 cardiac deaths, 1150 sudden deaths, 1837 Myocardial Infarctions, and 1490 strokes. It should be noted that this is a very high rate of adverse events, tallying at 22% of all participants. The populations studied appear to have been high-risk with the median age of participants being 68 and the range being 49-70; essentially an older and at-risk population was being evaluated. (All citations that are indexed on medline or otherwise located online that were included in this Meta-Analysis are cited right here, have fun! ; four of these were not double blind, two of which were dietary). 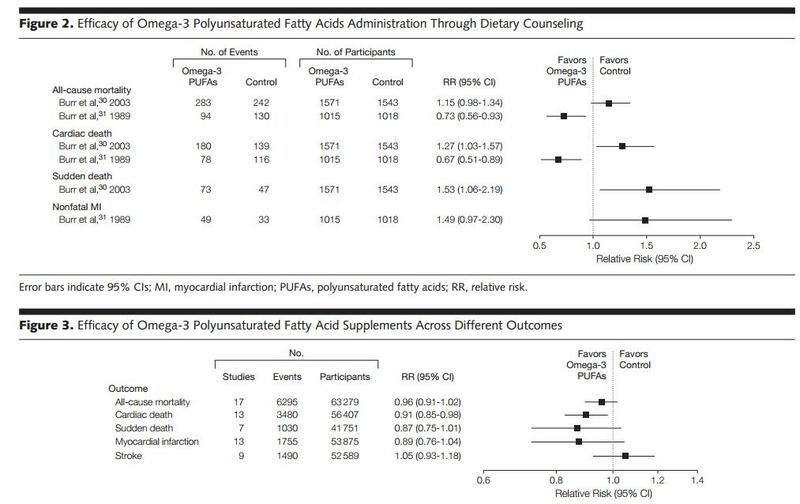 Only two trials used diets, so for the most part omega-3 supplementation was used with the average dose of 1.51g daily (0.77g EPA, 0.60 DHA, 1.37g EPA+DHA); this is a relatively low dose of fish oil, however it has shown protective effects in some interventions before. That being said, only 10 studies exceeded a daily dose of 1g fish oil, and with the median EPA+DHA being 1.0g, a few superloading studies skewed the aforementioned averages a bit. Below are Tables 2 and 3 from the study; I want to draw attention to Figure 3 as that seems to be where the conclusions are being drawn and it comprises the majority of the studies. So on the five outcome parameters, one of them (cardiac death) was statistically significant and in favor of fish oil (note: if it crosses the vertical zero point - 1.0 on this graph - it is not statistically significant). Mortality, sudden death, and MI all trended towards fish oil but were not significant; this does show benefit with fish oil, but apparently in a high-risk population with low-moderate dose fish oil it doesn't appear to be that huge of a protective effect. It is a cumulative reading, so work downwards. Basically the huge range seen (horizontal bar) and the degree of risk reduction (how far to the left of the center bar the black box is) are reduced when more and more studies are analyzed. Looking at the first study in isolation, the RR of 0.3 makes fish oil seem like an immortality drug, closer to the end, we get an RR of 0.96 (close to the 'true no effect' point of 1) that is no longer statistically significant like it was a bit earlier on. A quote from the authors in the discussion that I like is "The first quantitative synthesis in the field showed a strong, significant effect across all major cardiovascular outcomes. As more randomized evidence accumulated, the effect became weaker and nonsignificant and lost its universal aspect" with the magnitude and significance somewhat stabilizing over the last 5 years. The authors finished by concluding their limitations, like usual. Notice was paid to how the two biggest studies performed were also open label and how the authors could not refute the notions of performance and detection bias in the field, as well as the very large European descent studies with the largest being of Asian descent. Overall conclusions on this Meta-Analysis? 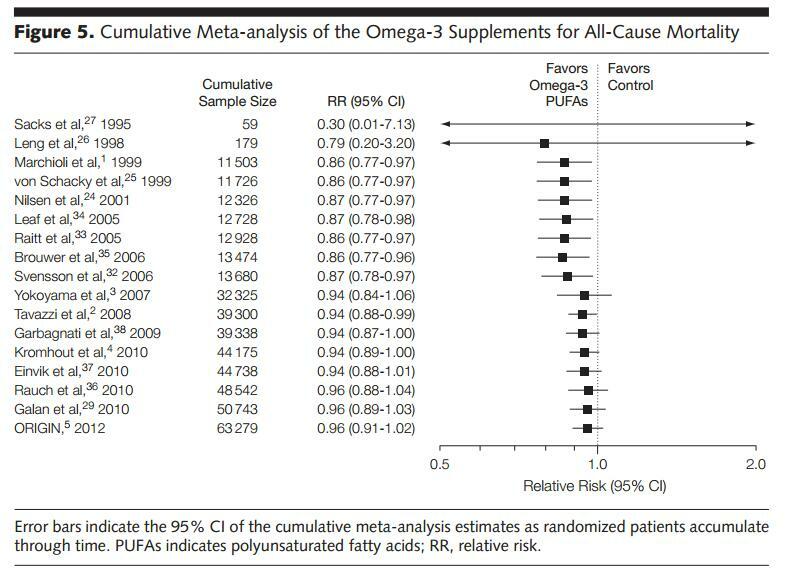 It did not say that fish oil is harmful, but it merely noted that the benefits associated with fish oil in regards to mortality reduction and myocardial infarction were both statistically insignificant. The benefit is still there, it is just not as potent as once thought. Please note that the application to these two specific topics. Overall conclusions summarized into one sentence? Fish oil's protective effects on the heart appear to be less potent than once thought, although are still beneficial for heart health in high-risk populations. Conclusions on younger and healthy populations cannot be drawn from this meta-analysis. Any statements (derived from this meta-analysis) akin to "fish oil pills don't help" without specifically mentioning protective effects of the heart are merely sensationalism.